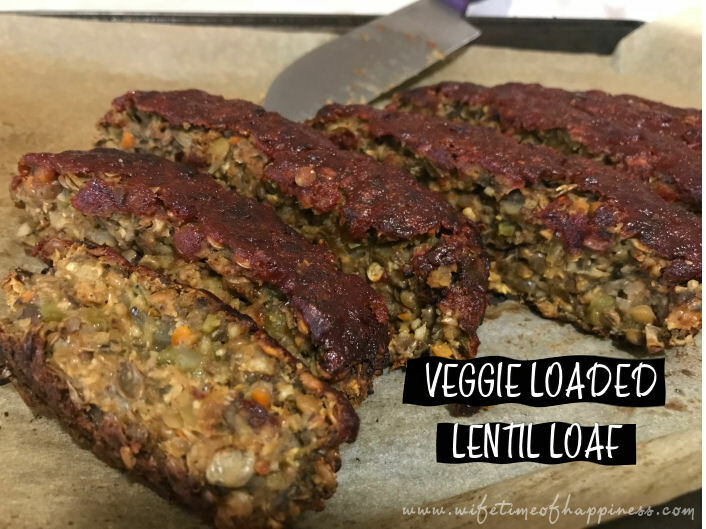 Lentil loaves take time and patience. They are perfect for a make ahead (or freezer) meal. So if you're looking for excellent results…don't skip those imperative steps!! Make it a full comfort tonight and add on these delicious Scalloped Potatoes! 1 tsp Liquid Smoke – No liquid smoke? Add 1 TBSP of your favorite BBQ sauce! 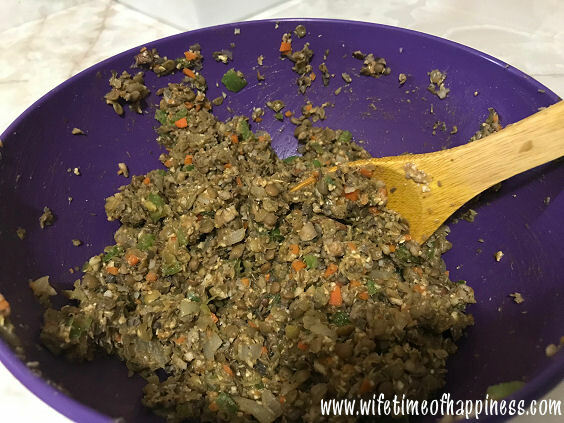 *TIP: If you have a food processor, throwing the veggies in and pulsing a few times will result in a perfect "chopped fine" result! In a large pot, add rinsed lentils and 2.5 cups of veggie broth or water. Season as you wish. I like to season my dark lentils with a few shakes each of: ground coriander, turmeric, black pepper, onion powder and paprika. Using medium heat bring liquid to a boil. Reduce heat to a simmer, cover and continue cooking for another 20-30 minutes. You will need to check on your lentils every once in a while to make sure you have not lost too much water/broth. Add a little as needed, but end result you will want your lentils cooked perfectly, not too mushy and with little to no liquid left. Once lentils are done, remove from heat (drain if you have excess water), place into a big bowl and allow to cool (about 10 minutes). While lentils are cooking, let's saute our veggies. Add onions, carrots, mushrooms and cook down for about 5 minutes. Next, add in the garlic and peppers; continue cooking for another 3-4 minutes. Once liquid has evaporated, remove from heat. Next, take a potato masher (fork or even the back of a large wooden spoon works fine too) and mash down the mixture a little. Not super mushy..leave a little chunky! Put mixture onto a parchment lined baking sheet (dampened well with water and a light coating of oil or cooking spray) and form into a loaf. You'll want to leave some heft to your loaf; I do about 1.5 inches in height. Give a coating of ketchup or your favorite BBQ sauce onto the top. Bake for 50 minutes. After the 50 minutes, give another baste of ketchup or BBQ sauce. Of course all cooking times vary, so you're looking for a nice crusty outside and a not too mush inside (so a bit firm to the touch in the middle). Once your loaf has come out of the oven you will want to give it proper cooling down time in order for it to firm up nicely. Slicing your loaf while still slightly warm will give you nice clean cuts. I usually wait about 60 minutes to do so. Remember, lentil loaves take time to firm properly. They do not contain the fats of ground beef that allow the same hardness or consistency; being patient with them is key. If we slice too early, or eat it up "too early" you may feel that the loaf did not work for you ("this is mushy" you will say haha). 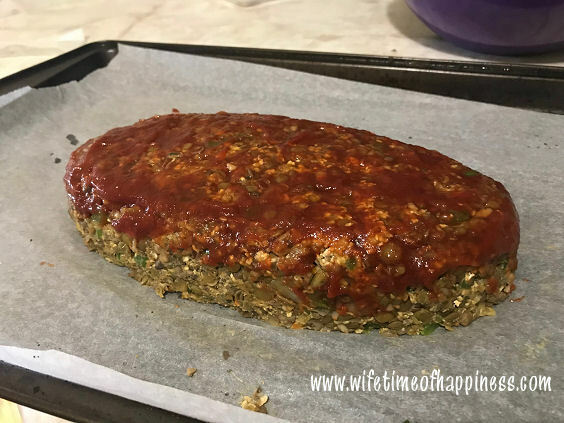 Ultimately, if you would like the perfect lentil loaf, make in the morning, serve later in the evening..or better yet, the next day! Lentil loaves make wonderful holiday meals or slice a big chunk for a lentil loaf sandwich!